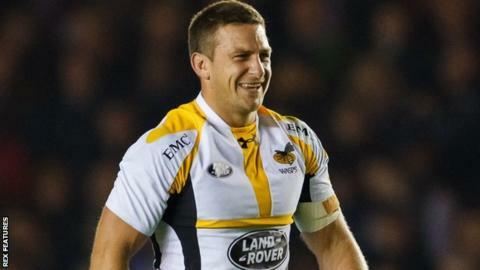 Wasps edged out last season's Premiership finalists Bath to record their first victory of the season. Wasps were awarded a penalty try early in the second half, as Bath scrum-half Niko Matawalu was sent to the sin-bin. The boot of Gopperth extended their advantage to 13 points and, although Ford added two further penalties, Bath could not force an equalising try. Overcast and rainy conditions made for a scrappy encounter at the Ricoh Arena as both sides favoured the kicking game in search of territory. The match's turning point came 13 minutes after the break when Matawalu was shown a yellow card by referee Craig Maxwell-Keys, after consultation with the television match official. The Fijian's clearing kick from inside his own 22 was charged down by Nathan Hughes, and Matawalu was then adjudged to have pulled back the onrushing number eight and denied a try. Although Bath worked their way back into the game through Ford's boot, Wasps put in an impressive defensive display to deny them a late try which could have brought the visitors level. "I thought we were by far the better team. We made a little bit of hard work of it. "Bath are never going to go away. We know that and that's why they got into the top four last season. "I thought we controlled most aspects of the game and we should have probably won it a bit more comfortably than we did. "We were found wanting against the top four teams last year. Today, we looked comfortable in that company." "I'm delighted with a bonus point after being 16-3 down away from home in those conditions. "Hand on heart we didn't look like we were going to score, but it was difficult." "I thought there was cover. George [Ford] was coming across. It's small margins, isn't it? "It went to the screen, so you've got to trust the TMO and the referee that they made the right decision. "We managed that sin-bin well. We're getting a bit too good at that after the two sin-bins last week." Wasps: Miller; Wade, Daly, Jacobs, Halai; Gopperth, Simpson; Mullan, Festuccia, Cooper-Woolley, Launchbury, Gaskell, Haskell (capt), Smith, Hughes. Bath: Homer; Rokoduguni, Devoto, Eastmond, Watson; Ford, Matawalu; Auterac, Batty, Thomas, Hooper (capt), Attwood, Garvey, Faosiliva, Houston.